Zoltan Istvan is an American writer, futurist, and philosopher. He has explored many countries as a journalist for the National Geographic Channel, as well as writing, filming, and appearing in dozens of television stories, articles, and webcasts. His writings have appeared in The San Francisco Chronicle, Outside, The Daily Caller, Vice, Gizmodo, and The Huffington Post. 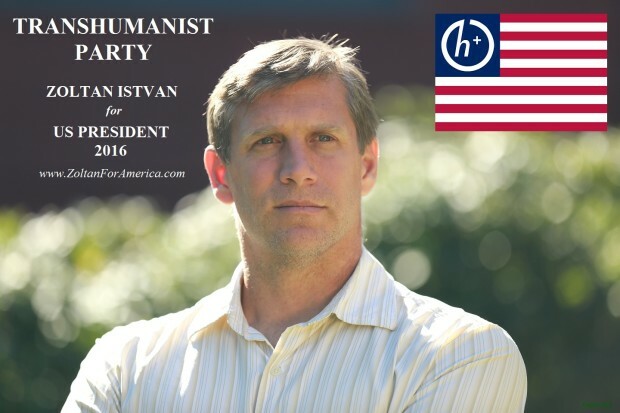 He is currently running for President of the United States to raise transhumanist political issues. Recently, he spoke with Futurism Contributor Daniel Araya about the future of humanity, transhumanist philosophy, and his bid for the presidency. DA: Zoltan, thanks for sitting down with me. Could you say a little about your background and your interests in Transhumanism. My background is largely in philosophy and journalism. In fact, a large part of my futurist career extends from my writing. I write a number of international columns, including a column for Vice and for The Huffington Post where I discuss transhumanism. It was actually my writing that helped me to decide to run for the Presidency as a transhumanist. There is a deep science void in American politics today, and I would like to see this changed through transhumanist thinking. Like most transhumanists I want to live forever, so it seems only natural that I would desire to have this reality made possible for all citizens of the United States. A transhumanist president could be very helpful in that respect. DA: We hear a lot about transhumanism these days. What is transhumanism and what are the implications for building an American Transhumanist political movement? Transhumanism is a social movement of at least a few million people (with hundreds of millions of supporters around the world) that wants to use science and technology to radically change the human being—and also change the human experience. This includes the design and development of medical technologies– robotic hearts, bionic limbs, and cranial implants, but also driverless cars and other technological innovations. Our goal is to augment human life through technology, and the implications of this goal are significant. We want, for example, to classify ageing as a disease. Like any other social movement, our movement is rooted in the desire to influence government with regard to public policy and legal reform. DA: In your novel, The Transhumanist Wager, you introduce the philosophy of “Teleological Egocentric Functionalism,” and outline “Three Laws of Transhumanism.” Could explain your thinking on this? The Transhumanist Wager presents a new and original philosophy called TEF or “Teleological Egocentric Functionalism.” TEF is predicated on the logical idea that human beings now face a simple wager: If a reasoning human being loves and values life, then they will want to live for as long as possible. That is, they will desire to become immortal. While most people around the world may believe that human immortality is still a century off or impossible to accomplish without divine intervention, researchers in the life extension and human enhancement fields know that we are only decades away from this goal. Irrespective of nationality, culture, heritage, or religion, TEF insists that the most important and urgent goal for any human being is to secure immortality—even if the attainment of that goal means the fundamental transformation of the individual into something nonhuman. TEF also insists that the most important and urgent goal for our society is to work towards ending death itself. DA: As I’m sure you are well aware, many people are anxious about the idea of “redesigning” human beings. How do you distinguish between Transhumanism and eugenics? Is there a concern that Transhumanism builds on older fascist notions about creating a “master race”? To begin with, we really must get over the word eugenics. Its true meaning is to improve the human race via purposeful design. On its face this is a very beautiful concept. However, due to the 20th century and maniacs like Hitler, the word has become loaded with terrifying ideas around racism and class war. In reality, the idea is more closely associated with scientists using gene-editing technology to conquer heart disease, cancer, and diabetes before they even occur in people; it is brilliant and very humanitarian. The truth is that I get asked about transhumanists creating a Master Race quite a bit. There is this fear that rich people will use technology to make themselves gods while leaving the poor behind. While this is a perfectly reasonable concern, I think these worries are unfounded. Technology has a long history of making the world a far better place for human beings. It has been consistently raising the standard of living for all people on Earth for centuries now. And as far as a Master Race is concerned, technology evolves too quickly to have races anymore. “Races” are a thing of the past in my opinion. They will not be around for more than a few more decades. Rather, what will exist are technologically enhanced human beings that use science to change their bodies and their lives. 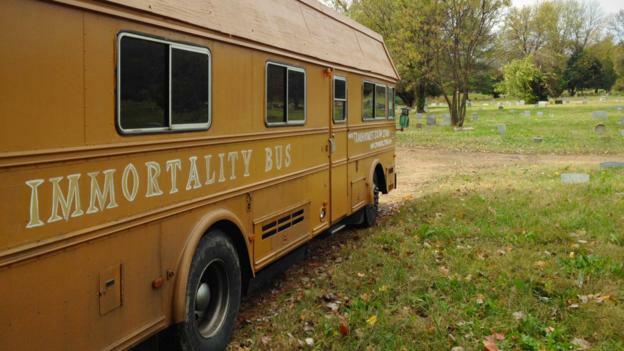 Istvan created the “Immortality Bus” using funding from Indiegogo. The coffin-seque bus is meant to be a a pro-science symbol of resistance against aging and death. DA: Assuming that you were elected to the Presidency, what public policies would you like to introduce? How would a Transhumanist America differ from the current model we have today? Article 1. Human beings, sentient artificial intelligences, cyborgs, and other advanced sapient life forms are entitled to universal rights of ending involuntary suffering, making personhood improvements, and achieving an indefinite lifespan via science and technology. Article 3. Human beings, sentient artificial intelligences, cyborgs, and other advanced sapient life forms agree to uphold morphological freedom – the right to do with one’s physical attributes or intelligence (dead, alive, conscious, or unconscious) whatever one wants so long as it doesn’t hurt anyone else. Article 4. Human beings, sentient artificial intelligences, cyborgs, and other advanced sapient life forms will take every reasonable precaution to prevent existential risk, including those of rogue artificial intelligence, asteroids, plagues, weapons of mass destruction, bioterrorism, war, and global warming, among others. DA: There is flurry of articles written recently suggesting that technology is disrupting both labor (through automation) and capitalism (through the elimination of scarcity). What is your view regarding the long-term relationship between exponential technologies and market-based societies? Is there room for a transhumanist society that is postcapitalist? This is an interesting question. In fact, I don’t think capitalism will survive the next 50 years—not in its’ current form. Robots and software are going to take virtually every job there is out there—and do a much better job than humans. This is why the Transhumanist Party and my candidacy support a Universal Basic Income. Human labor will become an oxymoron. But personal growth through education, enjoyment, and the reduction of suffering will enable us to extend and enrich our lives. I look forward to that future. We will no longer be slaves to the 9-to-5 corporate grind. We will be free to pursue our personal and shared interests—and let technology give us all the material resources we need to live happily. I would add that making this transition as painless as possible will require bold political leadership. And that’s why I’m running to be President. DA: One of the major strengths of the United States is a constitutional support for rights and freedoms. At the same time, a plethora of concerns overlapping gun violence, economic inequality, and climate change, suggest that there is a need for a complimentary focus on responsibility and the common good. Is there a framework within the Transhumanist political movement for developing increased personal and social responsibilities? Well to be frank, I’m not the biggest fan of the U.S. Constitution anymore. It’s a wonderful document—for an older age. But it doesn’t mention anything about 3-D printing, dirty bombs, or cranial implants that augment one’s intelligence. I think the reality of exponential technologies is changing our society significantly and moving us beyond the kind of society that the constitution was designed to address. Times are changing, and they’re changing very quickly. We need a significantly rewritten constitution that builds on the original, but also welcomes technology and the kinds of changes that technology makes possible. Here again, the Transhumanist Bill of Rights, which is just a first version, could help a great deal. Technology can help us achieve the most equal society, the most prosperous society, and the most happy society the world has ever known. But we must admit that we are no longer human beings in the traditional sense of the term, but transhuman beings. And we must understand that even transhumanism will be irrelevant one day as we evolve in and through a machine-driven post-human era. And of course, the most important question then is: Will machines even think or develop in the same way as humans? The frightening answer is, probably not. We are facing a brave new world now. As a species, we better get our act together to face it properly. Daniel Araya is a researcher and advisor to government with a special interest in education, technological innovation and public policy. His newest books include: Augmented Intelligence (2016), Smart Cities as Democratic Ecologies (2015), and Rethinking US Education Policy (2014). He has a doctorate from the University of Illinois at Urbana-Champaign and is an alumnus of Singularity University’s graduate program in Silicon Valley. He can be found here: www.danielaraya.com and here: @danielarayaXY.